The baby has reached the stage of infant-hood where she is never full. Never. I once asked our pediatrician if there was something wrong with her digestive system because it seemed like no matter how much I fed her, she never stopped shoveling in foods by the fist full. She is most ravenous in the morning, when I am at my most frazzled - hurrying us all out of the house to get to preschool drop off, grabbing lost shoes, making lunches and wishing for a caffeine IV. I also happen to have a habit of skipping breakfast for myself (fueled by the fact that I don't love traditional breakfast foods), so I thought I would get on this meal prepping thing and whip up something fast that could feed us on the fly for a few days with as little effort as possible. 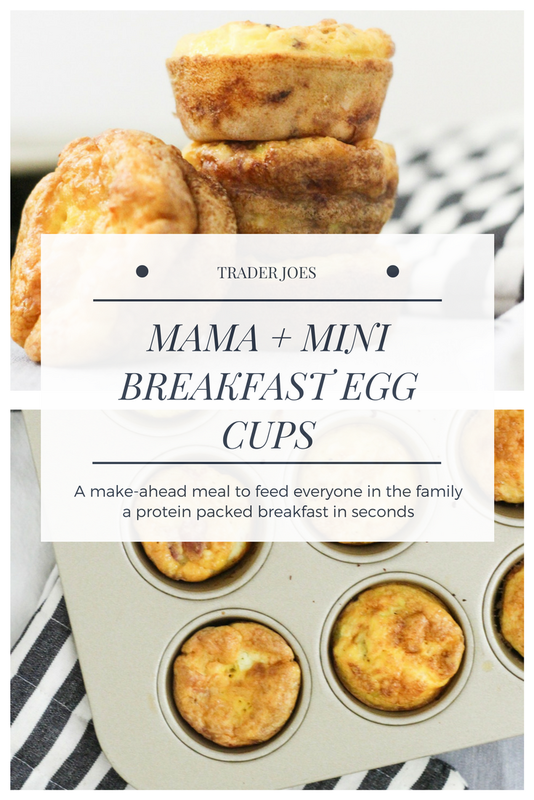 What I came up with ended up being a little Mama + Mini take on Egg Cups, with ingredients snagged on my run to Trader Joe's. The best part about the egg cups is that I sneak veggies into the baby's and use leftover dinner/lunch ingredients to make my own. To make things easy, I just used one cupcake tin, split between the two of us and as a bonus, the cooked egg cups can be refrigerated for a few days or frozen until you need them. My choices are very savory but you could absolutely use more traditional breakfast flavors like bacon or sausage and you can use leftovers like diced fajita veggies to keep things interesting. Divide one slice of prosciutto into three cups and top with 1tsp of goat cheese per tin. Remove from tins and allow to cool fully on a cooling rack so the bottoms do not become soggy. The consistency of the egg cups are perfect for anyone doing Baby Led Weaning or a toddler eating solids - I just warm the egg cup to room temp and break it into four big pieces before serving. Can be refrigerated in air tight container for a few days or frozen for later use!